After Sunheani-Talbot-Darracq combined financial collapse in 1935, Anthony Lago bought the French firm and renamed it Talbot Lago, a name it held until the line was discontinued in 1959. Lago’s engine modifications turned the line’s popular but aging six-cylinder sport engine into a higher-performance 4 liter, bringing the firm’s name back to the top of the list of European race champions. The highly stylized T150 body designs were created for the firm by the leading body stylists of the delay, Figoni & Falaschi. 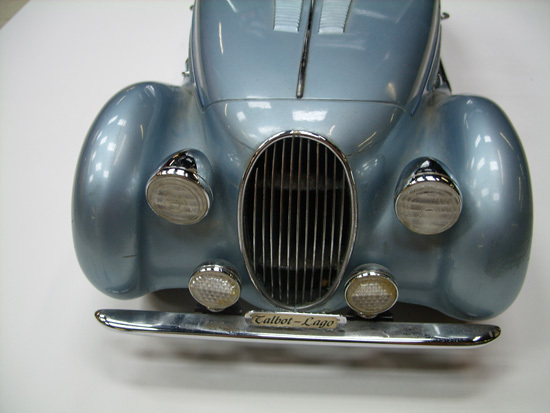 This firm is credited with the creation of the classic teardrop shape for which the Talbot Lago line was well known. 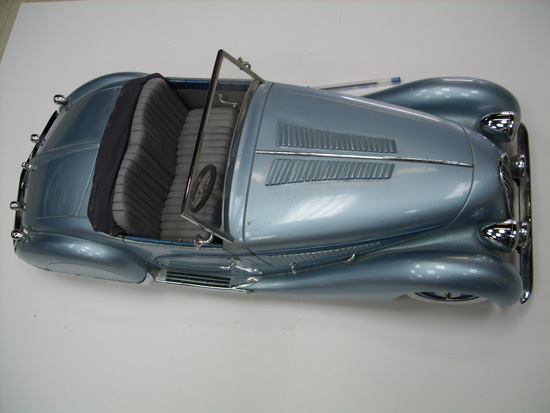 Figoni & Falaschi began to alter the highly stylized, expressionistic design with the company’s 1938 models, reducing the drop area between the fenders and the hood, eliminating the front wheel skirts (in all but one custom example that is known to still exist), raising the head lights, and abbreviating the long sweep of the tail. These basic changes appear on all of the Talhot Lago’s of 1938, which is helpful in identifying the year of production at a glance. 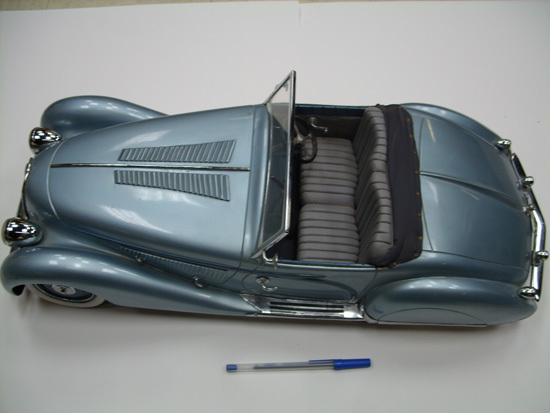 This 23″ long representation of the Talbot Lago T 150c Cabriolet from 1938 appears to be a manufacturer’s production design model. It is hand carved from a single piece of wood, with all body seams etched into their appropriate locations, not made from fitted pieces. As such, there is no articulation to the doors, trunk, or hood sections. 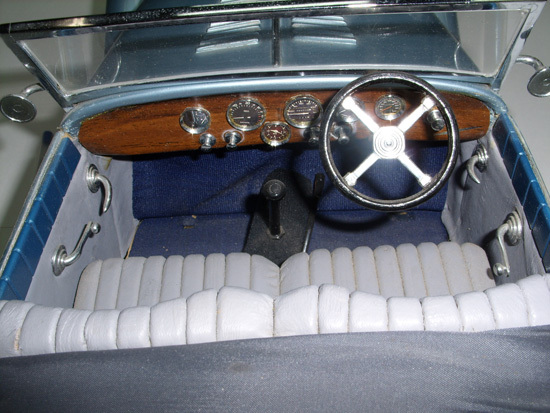 Only the cabin’s handbrake actually moves on this model; even the steering wheel and the wooden tires are fixed in position All of the chrome pieces are made from chrome plated castings that have been mounted to the body. Fitted sections of board seal off the model’s under carriage. The right rear wheel is missing the special finial that mounts through the hubcap and to the axle bolt (also missing, but looks like a standard hardware Piece; the original hubcap and wheel are still here). 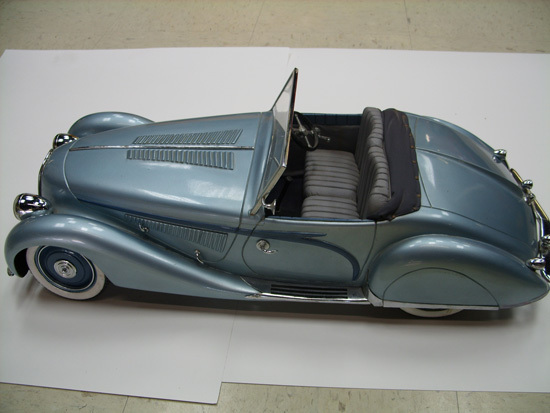 The model appears flawless in all other regards, right down to the paper license plate that reads “1937,” the year the model was carved for the following year’s design. 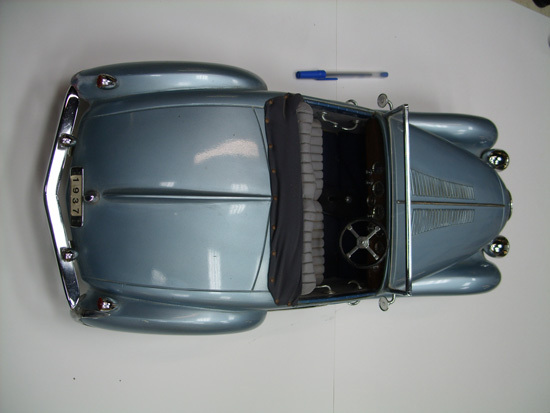 A true and extremely valuable rarity from one of the most desirable of all the classic European sports car designers!